Kazakh farmers will have to slaughter most of their cattle, as continuously dry weather poses serious threat of losing the entire livestock, the July 31 meeting of the farmers in South Kazakhstan region concluded. The hot summer and lack of fodder has been forcing Kazakh farmers to sell off cattle in Kyrgyzstan at below market prices. Some farmers are loaning their cattle to Kyrgyz farmers who have fodder to feed the cattle. In exchange, Kyrgyz farmers are allowed to keep offspring. However, neither of the taken measures has helped farmers averting massive slaughter of their cattle as the end of summer season promises to be very dry with daily temperatures as high as 40 Celsius. 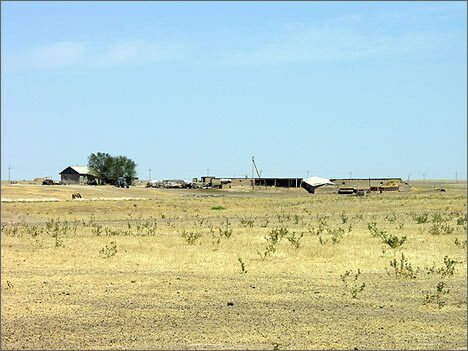 Besides high temperatures, pastures in Kazakhstan suffered devastating spring floods and locust plague. Ospan Ukybayev, head of the agricultural department at the local administration in the Saryaghash province of South Kazakhstan region said that locust plague and drought forces farmers to slaughter at least forty percent of their cattle. Kazakh Prime- minister Karim Masimov ordered in early May to organize state purchasing of meat under fixed prices from farmers. However, lack of refrigerating equipment slows down the purchasing and makes farmers suffer significant losses. Nevertheless, Nurzhan Parpiev, agricultural specialist at the Saryaghysh province administration does not think that the situation is hopeless. “Of course, locust plague and drought at one time is very unusual to us. However, Kazakhs have been breeding cattle for centuries and have their own “side-tracks”. For instance, they have their ways to relocate herds, connections with relatives in other regions with more affluent pastures,” Parpiev says. He says that state food supply corporations provide significant help to those farmers whose pastures were attacked by locust and drought.